When it comes to optical fiber communication, we are impressed with its fast speed, large information capacity and bandwidth. To achieve this result, numbers of optical components play key roles in optical systems. Optical amplifier is one of them. When transmitted over long distance, the optical signal will be highly attenuated. On this situation, optical amplifier makes a difference. Today, this article will give a brief overview about optical amplifier to help you learn more about it. Usually a basic optical communication link consists of a transmitter and receiver, with an optical fiber cable connecting them. Even if signals in fibers suffer less attenuation than in other mediums, there is still a limited distance about 100 km. Beyond this distance, the signal will become too noisy to be detected. Optical amplifier is a device designed to directly amplify an input optical signal, without needing to transform it first to an electronic signal. And at the same time, it can strengthen the signal, which is conducive to transmission over long distances. Here is a comparison figure. In the (a), it is an electrical signal regeneration station. We can see all the channels are separated, signals detected, amplified and cleaned electrically, then transmitted and combined again. However, in the figure (b), it is an optical amplifier in which all channels are optically and transparently amplified together. Compared to electrical amplifier, optical amplifier is more cost-effective. Because it amplifies signals directly, and needs less cost. Generally, there are three common types optical amplifier: the erbium doped fiber amplifier (EDFA), the semiconductor optical amplifier, and the fiber Raman amplifier. The amplifying medium of EDFA is a glass optical fiber doped with erbium ions. 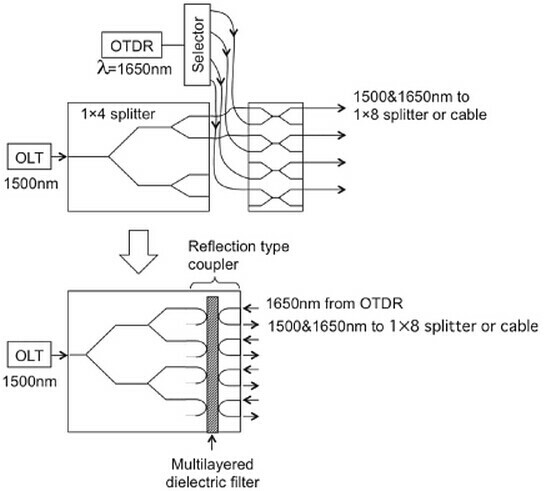 The wavelength near 1550 nm can be amplified effectively in erbium doped optical fiber amplifiers. What’s more, EDFA has low noise and can amplify many wavelengths simultaneously, making EDFA widely used in optical communications. According to the functions, EDFA usually has three types: booster amplifier, in-line amplifier and pre-amplifier. A booster amplifier operates at the transmission side of the link, designed to amplify the signal channels exiting the transmitter to the level required for launching into the fiber link. It’s not always required in single channel links, but is an essential part in WDM link where the multiplexer attenuates the signal channels. It has high input power, high output power and medium optical gain. The common types are 20dBm Output C-band 40 Channels 26dB Gain Booster EDFA, 16dBm Output C-band 40 Channels 14dB Gain Booster EDFA and so on. Of course, there are still different specification of booster amplifiers which cannot be listed here. Here is a picture of 23dB Output 1550nm Booster EDFA Optical Amplifier. An in-line amplifier typically operates in the middle of an optical link, which is designed for optical amplification between two network nodes on the main optical link. It features medium to low input power, high output power, high optical gain, and a low noise figure. At the end a pre-amplifer makes a difference. Pre-amplifier is used to compensate for losses in a demultiplexer near the optical receiver. It has relatively low input power, medium output power and medium gain. Semiconductor optical amplifier (SOA) uses a semiconductor to provide the gain medium. It operates with less power and is cheaper. But its performance is not as good as EDFA. SOA is noisier than EDFA. Therefore, SOA is usually applied in local area networks where performance is not required but the cost is an important factor. In a fiber Raman amplifier, power is transferred to the optical signal by a nonlinear optical process known as the Raman effect. Distributed and lumped amplifiers are the two common types of Raman amplifier. The transmission fiber in distributed Raman amplifier is utilized as the gain medium by multiplexing a pump wavelength with the signal wavelength, while a lumped Raman amplifier utilizes a dedicated, shorter length of fiber to provide amplification. Here is a Raman amplifier. Optical amplifiers perform a critical function in modern optical networks, enabling the information transmitted over thousands of kilometers and providing the data capacity which current and future communication networks are required. Amplifiers mentioned above are available in Fiberstore. If you are interested, please visit FS.COM for more information. This entry was posted in Fiber Optical Amplifier and tagged EDFA, optical amplifier, Raman amplifier, Semiconductor Optical Amplifier on August 18, 2016 by Chloe Wang. Optical communications are more and more prevailing for the high demand for telecommunication, video and data transmission. The optical fiber is capable of transmitting many signals over long distance to meet people’s various requirements. But the signals are easily attenuated in the long-distance high speed networks. Amplifiers are a key enabling technology for strengthening optical signals. Electrical amplifiers are originally used but gradually replaced by optical amplifiers. Optical amplifier is a device that can amplifier optical signals directly without the need to convert them into electrical ones. Electrical amplifier is originally used but gradually replaced by optical amplifier. It is a much cheaper solution in comparison with electrical amplifier which has costly conversions from optical to electrical signal. The longer the transmission distance is, the more electrical signals need to be converted, which makes the cost of electrical amplification higher and higher. So optical amplifier is used in an increasing number. More detailed information about it is as followed. Optical amplifiers can be used as power boosters, in-line amplifiers and detector pre-amplifiers in fiber optical data links. Booster amplifiers are used to increase the optical output of optical transmitters when signals haven’t entered the optical fibers. Once transmitted, the optical signals are attenuated by 0.2dB/km. In-line amplifiers are then used to restore the optical signals to its original power level. At the end of the data link are pre-amplifiers which are used to increase the sensitivity of an optical receiver. There are three most important types of optical amplifiers including erbium-doped fiber amplifier(EDFA), semiconductor optical amplifier (SOA) and Raman amplifier. Here will introduce them briefly. Erbium-Doped fiber amplifier: it is an optical or IR repeater that amplifies a modulated laser beam directly without optical to electrical conversion. It uses a short length of optical fiber doped with the rare-earth element erbium. The signals-carrying laser beams are usually at IR wavelengths with application of external energy. It has low noise and capable of amplifying many wavelengths simultaneously, which is an excellent choice in optical communications. Raman amplifier: it is an optical amplifier based on Raman gain created by Raman scattering, which works entirely differently from EDFA or SOA. Raman optical amplifier have two key elements: the pump laser and the directional coupler. The pump laser has a wavelength of 90 nm to 1500 nm. The circulator provides a convenient means of injecting light backwards in to the transmission path with minimal optical loss. Raman amplification occurs throughout the length of transmission fiber, which makes Raman amplifier known as distributed amplifier. This entry was posted in Fiber Optical Amplifier and tagged EDFA, optical amplifier, Raman amplifier, SOA on July 13, 2015 by Admin. We know, fiber optical splitter is a key optical device in PON systems, which splits the optical signal power finally into all the output ports. In the PON field plant shown in the Figure, a 1×8 Fiber Splitterto 1×32 fiber splitter is placed on an electric pole, connecting the distribution optical cable in the air and the drop wire to the customer premises. A 1xN optical splitter can be part of an N x N optical star coupler. For example, a 16×16 star coupler with four-stage topology is illustrated in the Figure, and the dotted line denotes a 1×16 optical splitter. The star coupler can be constructed by cascading 3dB couplers in the perfect shuffle topology. The 3dB coupler has two input and two output ports, and it splits the input power 50:50 to the output ports. 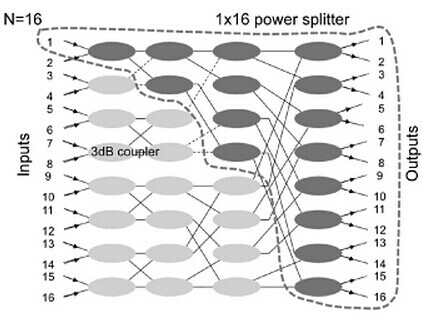 The insertion loss of the commercially avaiable 1×16 star coupler, for example, is about 13to14 dB, including excess loss of 1 to 2dB in both fiber type and PLC coupler. The polarization dependent loss is as 0.3dB. 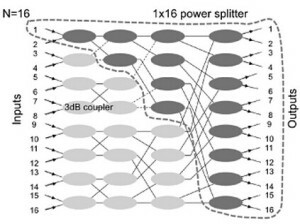 Consider a passive double star configuration configured with 1 x4 optical splitter in the central office and 1×8 optical splitter in the outside plant. 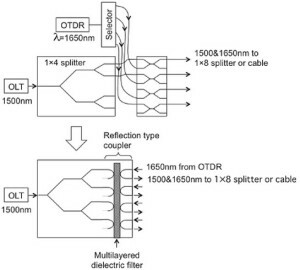 As described, for example, in order to test in service fiber cables in the ODN, optical couplers have to be inserted between the 1×8 optical splitter and the ONUs, and the output at the wavelength of 1650 nm from the optical time domain reflectometer (OTDR) placed at the OLT is launched in the coupler. Note that this OTDR signal has to be cut off in front of the ONU and the OLT to pass only signals at 1310 nm and 1550 nm. Compared with the separate device configuration, the integrated device will provide ease of handling because the input ends of the couplers and the Optical Splitter are on opposite sides. This entry was posted in Fiber Optical Amplifier on March 4, 2015 by Admin. One of the goals that being received in any telecommunication connections to offer the longest distance between transmission systems such as undersea, intercontinental and terrestrial connections. In common sense, components employed between transmission ends are appropriate to be reduced to keep up an expensive performance. Fiber Optic Amplifiers in optical communication become significant as there is not an expensive repeater. Optical transmission systems designed for making are a selection of network application. Usually, unreported optical system connects an island to the mainland via undersea outdoor fiber optic cable as well as a group of islands. Transmission connections along coasts of a mainland are more favorable as well as a group of islands. Transmission connections along coasts of a mainland are more propitious as most of the population around the globe are located near the ocean. Unregulated systems are significantly complete the repeated system. Furthermore, mixing it with other types of connections within a terrestrial network can be made where the optical transmission systems allow a transmission crossing the wet area. A locally pumped post EDFA or Booster Amplifier boosts the signal level before launching it into transmission fiber connections. The boosted signal amplifier, similar product: CATV signal amplifier, can be further amplified using forward distributed Raman amplifier (DRA). A post R-EDFA is located a few tenths of kilometers from the transmitter ti amplify the weak signal. This EDFA pumped via a amplify the weak signal. This EDFA pumped via a dedicated pump fiber. The figure displays the signal power evolution, represented by a dashed line along transmission distance utilizing forward DRA and post R-EDFA. On the other hand, the figure shows that signal power evolution with respect to backward DRA and pre R-EDFA. At the receiver terminal, a deceived pre EDFA is used to amplify the received signal, this local pumped EDFA followed by optical filter and an optical to electrical converter. System configurations show a practical implementation and typical positions of the R-EDFA and DRA in order to improve the transmission performance. Furthermore, two principal factors affect the optical transmission performance. The first factor is the system configuration, where various system configurations were examined and criticized. It shows that the configuration has a direct impact on the performance. The second factor is the total pump power injected into the system. By increasing the total pump power, the transmission distance can be expanded. On the other hand, improving the total injected pump power increases the non-linear effects of the transmission fiber, which degrades the system performance. Until now, there are not any clear and structured design rules for optical transmission systems. Therefore, design rules for optical transmission systems have become indispensable in this field. Finally, future researchers are asked to focus on reducing the noise figure at high pump powers. This entry was posted in Fiber Optical Amplifier and tagged Booster Amplifier, EDFA, outdoor fiber optic cable on January 14, 2015 by Admin.